The deadline for this competition is Nov 25th. The best caption will be chosen and the winners name and caption will be posted on the www.our-happy-cat.com competition page. 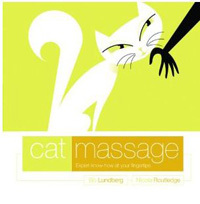 This month the prize for the competition is a book called "Cat Massage" byBo Lundberg and Nicola Routledge. Well we all know that cats can be fickle things don't we? And finding the right cat bowl for my two boys Byron and Shelley has been an ongoing saga! I've tried big bowls and small bowls, plastic dishes and metal dishes and all sorts in between. One of the main problems I had was that Byron kept picking his food out of his bowl and putting it on the floor next to him to eat. Lovely! Cat food all over my floor, even if I had a wipe clean cat mat underneath. 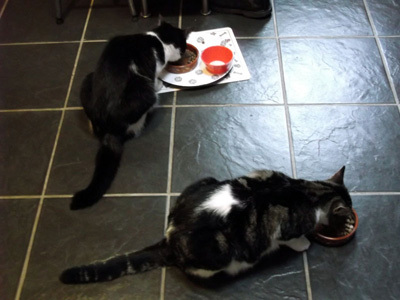 That was before I knew about 'whisker stress' which you can read more about on my page all about cat food bowls. The bowl I was using at the time was too deep and narrow for Byron and his whiskers would have been rubbing against the side of the food bowl and irritating him. 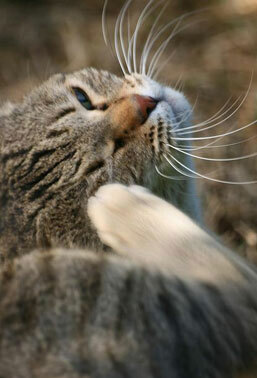 What flea treatment is best at getting rid of fleas from your home? This is a question I am often asked and one that cannot be answered with a single product. The secret to ridding your home of fleas for good is to carry out a series of actions repeatedly over a period of time to ensure that not only live fleas are killed but that also dormant eggs and pupae are also eradicated. The flea life cycle means that just killing the actual adult fleas on your cat is not enough to ensure that your pet won't become re-infected again. 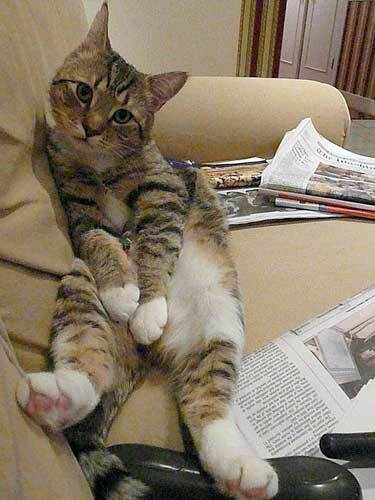 To fight fleas the whole home environment needs to be treated as well as your cat. Obviously vacuuming often and keeping your home clean is the first step but if you are unfortunate enough to have a flea's infestation, here are the steps and flea treatment to take to tackle the problem. For heavy infestations, remove and destroy all of the cats bedding and any textiles used by your cat. This may sound drastic but because the eggs and larvae can embed themselves in fibres, it is sometimes better to just get rid of things rather than try and wash them.